Virgin Sailing,Yacht Charters - Cruising in the BVI, Caribbean, Mediterranean and the South Pacific. At Virgin Sailing we combine a premier, all-inclusive service with a comprehensive listing of the world’s finest sail and motor yachts, covering areas including the Caribbean, Mediterranean and South Pacific in particular we specialise in British Virgin Islands yacht charters. Our team is led by Chris & Joanne Plowman. After a successful corporate world background and then a 10-year career as Professional Yacht Captain and Chef, they decided to use their vast knowledge of the Charter Yacht industry to create the yacht brokerage ‘Virgin Sailing’. Chris uses his experience and knowledge gained through corporate management and his long sailing career to achieve the highest standards in the industry. He holds a commercially endorsed Royal Yachting Association Ocean Yachtmaster certificate, is a PADI Dive master and holds a HNC in Management and an ONC in Engineering. 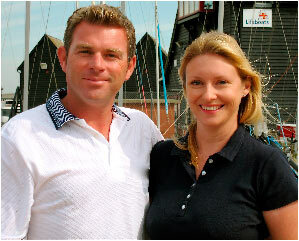 Chris is a Gold member of the Royal Yachting Association. Joanne has been a Charter Yacht Chef for 10 years and in addition to the skills she has attained in corporate administration, she continues to refine her culinary expertise at every opportunity. As part of her role searching and evaluating suitable yachts for presentation to clients, Joanne attends numerous yacht charter shows and has a great knowledge of all the current yachts and their crews. Chris and Joanne currently divide their time between the Caribbean, Antibes, France and Kent in England. This enables them to visit all the relevant Yacht Charter Shows both in Europe and the Caribbean and gives them the unique qualification to match charter clients to their perfect crewed yacht. Remember Virgin Sailing provide expert, independent advice at no charge to the client.